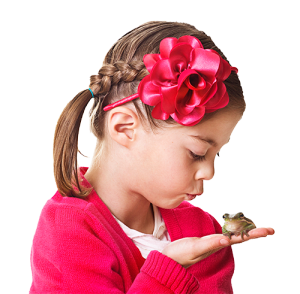 Did you ever consider that the holidays are the easiest time to practice “ frog kissing”? The holidays occasionally bring out the frog in all of us. Between crowded malls, buzzing airports and hectic family get togethers, it’s enough to make the sanest among us want to shout “Bah, humbug!” In spite of all the seasonal cheer, most people are busy, stressed and tired. Now, more than any other time of the year, people need words of kindness, encouragement and positivity. View this as an opportunity, not an inconvenience, as you put a new habit into practice. If your own heart is feeling two sizes too small this time of year, I’d challenge you to try “frog kissing” someone else. Aside from brightening their day, it continues to create a new habit in you—one of building others up, fostering teamwork and opening up channels of honest, productive communication. Who doesn’t want to work with, live with, promote, or hire someone with those qualities? Put “frog kissing” into practice this month and you may have the people closest to you wondering if your attitude isn’t the result of a Christmas miracle! How will you be “frog kissing” during the holidays? This entry was posted in sticks and stones, Uncategorized and tagged attitude, Christmas, feelings, Frog Kissing, Love, Passion, perspective, Positive, relationships, Sticks & Stones, Team, Words on December 16, 2013 by Dave Weber. How would your tweets change if you thought 140 characters had the power to alter your future? A few weeks ago, I read the most fascinating article in the New York Times. With the explosion of social networking, more college admissions view applicants’ Facebook pages and Twitter feeds as a part—officially or unofficially–of their review, which is causing some students to lose the opportunity of attending the college of their dreams. While this may be new to the world of college admissions, businesses have been screening job applicants’ social media usage for years. I’ve been amazed at the capacity for decent, polite, and respectful people to log on to the Internet and spew negative, hateful, and just plain mean speech. I shudder to think what my 18-year-old self might have said if I had that kind of social platform in my formative years. Social media is a great way to stay abreast of current events, keep in touch, and find links to thought-provoking articles and blogs (cough, cough). But even 140 characters can be wielded to tear down someone else’s reputation, and as this article observes, unintentionally damage your own image. In my book Sticks and Stones Exposed, I talk a lot about the power of positive uplifting words. After reading the Times piece, I wonder what would have happened if the admissions officers had seen positive words on the applicant’s social media feed—encouragement to a fellow student, excitement for a campus visit, gratitude to a coach or a teacher. Likewise, if a hiring manager searched for an applicant’s blog and discovered insightful business posts or Facebook shout-outs thanking colleagues for their contributions to a big project. You see, in addition to inspiring others around us, positive words reveal what we can contribute to a group—be it a professional organization or a college campus. Positive words are the hallmark of the inquisitive mind, the team player, and the great collaborator. Which are exactly the kind of students universities want to accept, and later, the kind of professionals companies are clamoring to hire. You may not be a “leader” in you business, school, or community, but you can be a leader to others in the way you conduct yourself online. Instead of tearing people down, laugh at yourself. Rather than complaining, share something that you’re thankful for. Your influence and attitude online has the ability to move you closer to achieving your goals or abandoning them—140 characters at a time. Commentary on NYT Article “They Loved Your GPA then they Saw Your Tweets” and the power of words. This entry was posted in Leadership Redefined, sticks and stones, The 12 X's of Leadership and tagged 12 X's, attitude, change, Education, Experience, feelings, Filters, Integrity, Leadership Redefined, Learning, Listening, obstacles, perspective, Positive, relationships, Sticks & Stones, Success, Team, Words on December 9, 2013 by Dave Weber.